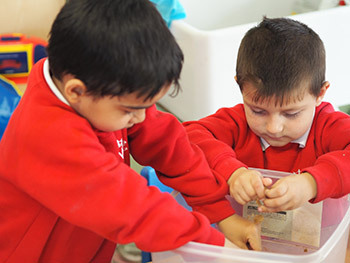 Morning Nursery operates from 8:45-11:45am and afternoon Nursery from 12:15pm -3.15pm. Reception starts at 8.55am (doors open at 8.45am and the school day finishes at 3.15pm. Please make sure you are on time and you bring your child to their class door/teacher. Please make sure you are on time to pick your child up as they can, at this age, get quite upset, if you are running late, please make sure you inform the school. If a different person is picking up your child, please ensure you have informed us about it, and where possible introduced us to them. Every child has their own Learning Journey Book which is kept in their class and you are welcome to look through it and add your own comments. 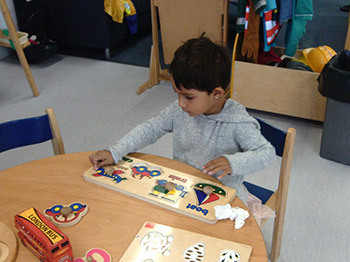 We also operate an open door policy every Tuesday in the Nursery between 8.45-9.15am and 12.15-12.45pm and you are welcome to visit and join in for ‘stay and read’/’stay and play’ sessions. Please make sure your book bag is in school with you every day. Please remember to bring in your PE in drawstring bag and leave in school. Homework diaries and reading books must be brought in to be changed on the correct day. It is important that have breakfast before you come to school and wear your uniform. This way you come to school ready for learning. Make sure you are wearing sensible shoes and are dressed appropriately for the weather. Jewellery is not allowed in school. 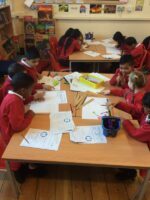 In Reception homework is given out each week on Friday. It will alternate between Literacy, Maths and Topic work. Please complete each week. Homework books will be given out on Fridays with an expectation that they are returned by Wednesday at the latest. Children will be awarded in the form of merits, praise and certificates for effort and presentation. 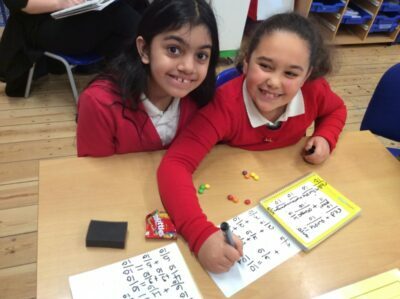 We feel homework is an important part of children’s learning and hope that this new format will give you more information on what is being taught in the classroom. If you have any questions please speak to your child’s class teacher. Set up a homework-friendly area. Make sure children have a place to complete homework. Keep supplies — paper, pencils, glue, scissors — within reach. Set a regular study time. Some children work best in the afternoon, following a snack and play period; others may prefer to wait until after dinner. Keep distractions to a minimum. This means no TV or loud music. Make sure children do their own work. They won’t learn if they don’t think for themselves and make their own mistakes. 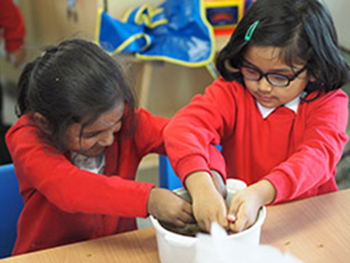 Parents can assist by making suggestions but children should take ownership of their own work and be encouraged to become independent learners. Be a motivator and monitor. Ask about projects, assessments, and tests. Give encouragement, check completed homework, and make yourself available for questions and concerns. Set a good example. Do your children ever see you reading a book? Children are more likely to follow their parents’ examples than their advice. Praise their work and efforts. Put Certificates on the fridge. Mention academic achievements to relatives. Know the teachers — and what they’re looking for. 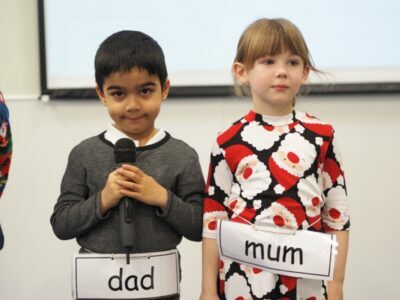 Attend school events, such as Parent’s Evening to meet your child’s teacher. Ask about their homework policies and how you should be involved. Thank you. Early Years Team. 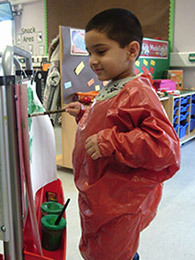 The EYFS has strands that we use to plan and assess children that are age related. See below for a brief description of these strands. The Nursery children have settled in and have been learning about themselves. 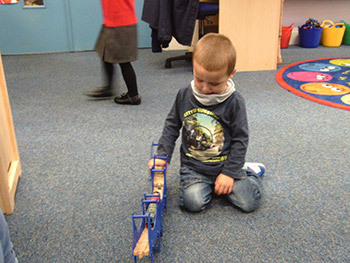 Here are some pictures of the fabulous learning we have been doing in nursery. 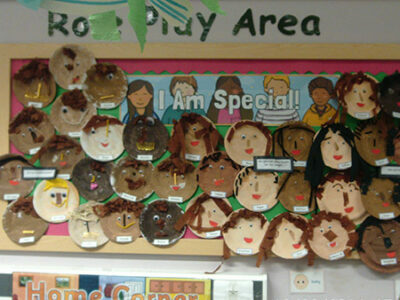 In our Nursery we value that we are all special and different! This term our topic is ‘People Who Help Us’. We have been learning about all the different people who help us at home, at school and in our community. We discussed in detail how doctors, nurses, police officers, firefighters; post deliverers and many more all help us in our community. 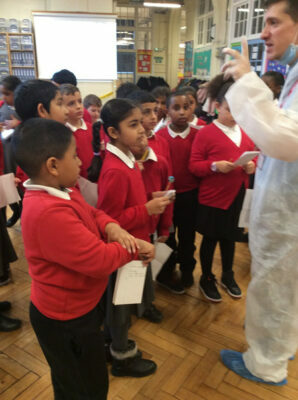 We learnt about their job and the different things they do, we even looked at some of the tools and equipment they may use for their job like doctors using a stethoscope to listen to the heart and lungs. We really enjoyed the role playing the different occupations. We were lucky enough to visit the local fire station and ask the firefighters questions about their job. They showed us some of their equipment and the huge fire engine! We had the chance to visit the local post office; we wrote letters and posted them into the red post box. We gathered that there are so many people who help us on a daily basis and we are going to try our best to be someone that helps too! 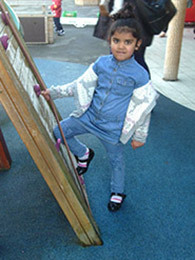 This term our parents came to school for Stay and Play sessions. 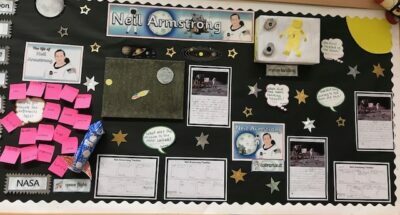 The parents watched the teachers deliver lessons and explored the provision with their child and looked through their learning journey books and celebration displays. Also this term parents were invited to the second reading workshop. During this workshop parents watched their child being taught how to read followed by a question and answer discussion session in the Hall. Early years had a fabulous week learning about the role of the police force as part of Enterprise week. 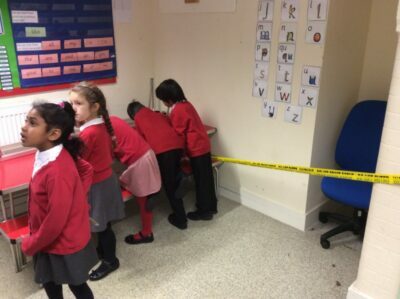 The children visited a “crime scene” where they had to look for clues. They met PC Sam who collected the evidence and asked children to search for the suspect! 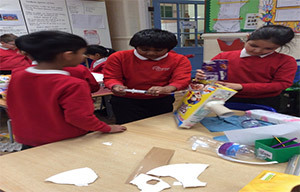 The children made various equipment such as: handcuffs, helmets and police radios. 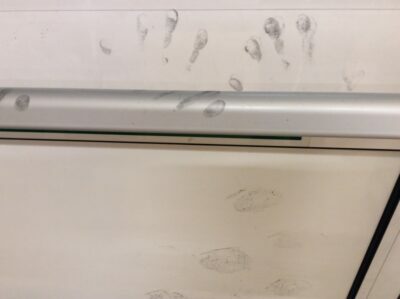 They also were finger printed and completed an incident report as part of the weeks learning. 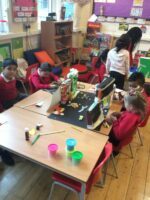 The weeks learning culminated in an invitation to the parents to come in and see their children’s work which the children thoroughly enjoyed. 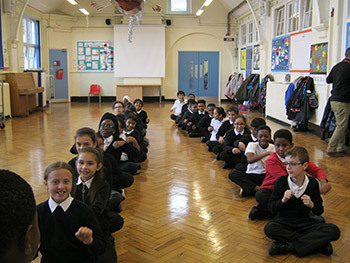 The children worked hard to learn different song, actions and dance routines. 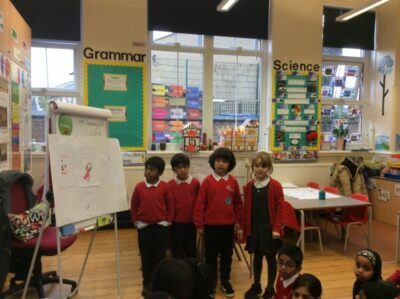 They even had to practise lines which they read aloud in front of a big audience! 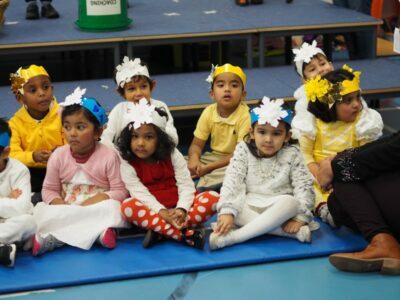 They did a superb job on the day and our parents thoroughly enjoying watching them. 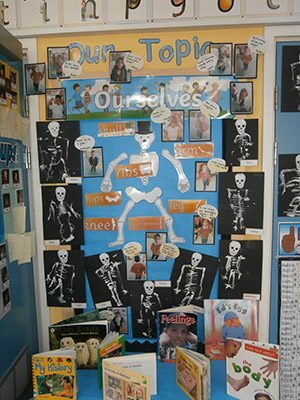 The children in Reception have been learning about themselves, in particular naming their body parts. 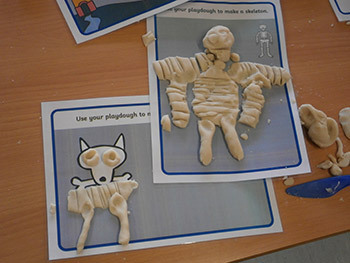 We looked at the story Funny bones and had great fun designing and painting our own skeletons. 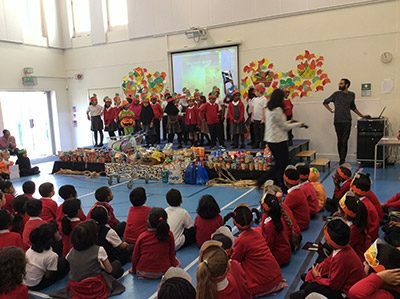 We learnt the song, “Them Bones” and had a special world of work week where we learnt how to stay healthy by eating a range of healthy foods. 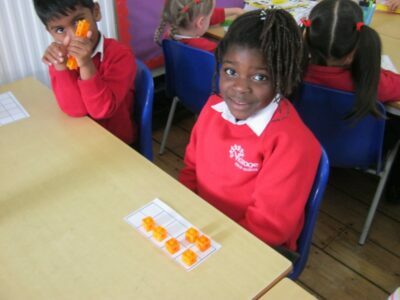 In Reception we have been learning all about 2D shapes. 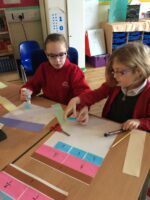 We have been learning the names of the shapes and their properties. 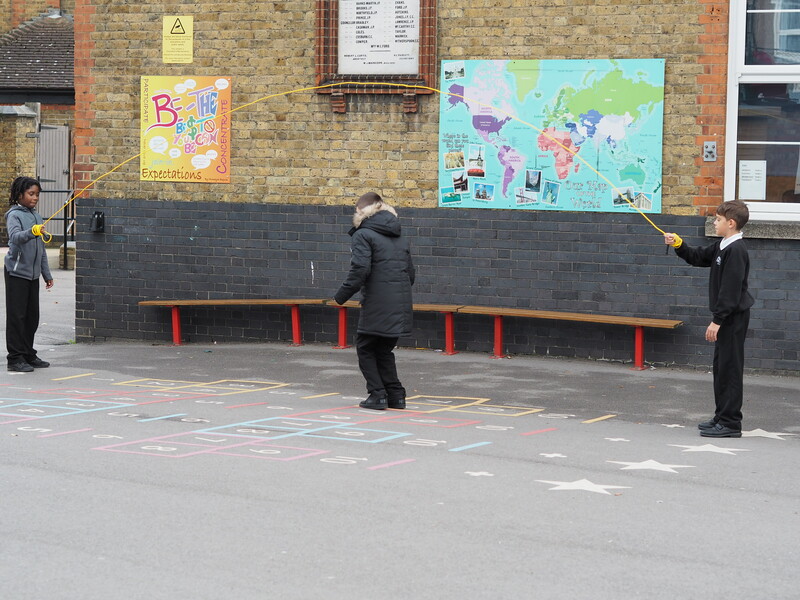 We have been on a shape walk around the school to identify shapes in our environment. 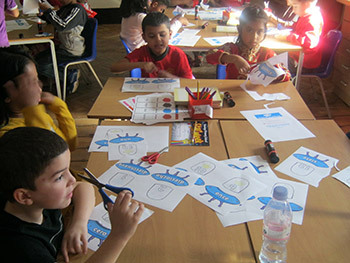 The children have also got creative and made their own pictures using lots of 2D shapes. During world of work week Reception classrooms were turned into cafes. 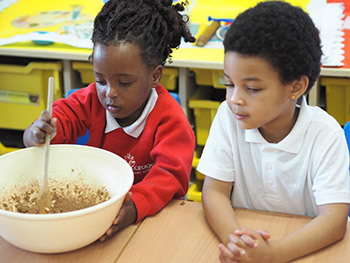 In order to learn about healthy eating all four classes made Crispy Flapjacks. 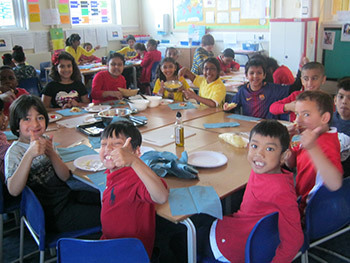 The children thoroughly enjoyed making cakes. 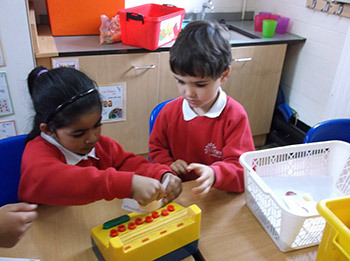 Whilst having fun they learnt about measuring amounts (Maths), taking turns and waiting patiently (PSED), describing what they were doing (Communication and Language) and keeping their hands clean for the whole lesson (Physical Development). All classes thoroughly enjoyed making the cakes but most of all loved eating them! Throughout the coming year we will be continuing cooking skills. Please discuss and include your child at home when you are cooking. 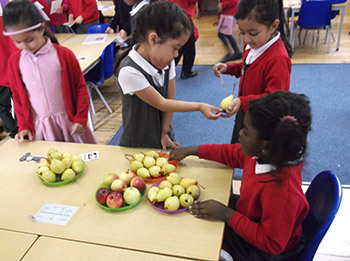 Discuss the importance of keeping safe in the kitchen and healthy eating. 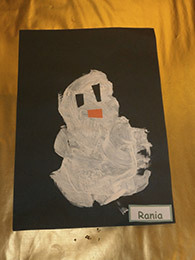 This term we read the ‘Owl Babies’ story and did many activities linked to the story. We became authors and re-told the story using some of the illustrations from the story. 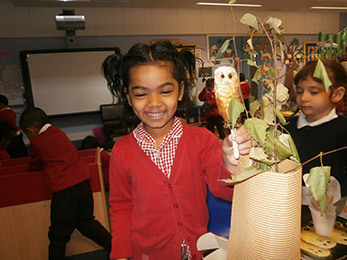 We also re-told the story by acting out our favourite part using owl puppets. 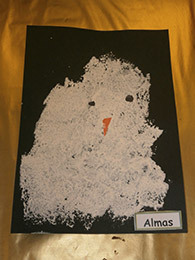 In the creative area were made colleges of owls and we painted owls using sponges. During circle time we discussed how the owls were feeling when mummy owl left them, we also thought about how we felt on our first day in Reception and our parents left us. Some of the words we used were ‘sad’, ‘upset’, ‘nervous’ and ‘scared’ but some of us were ‘excited’ to start big school! 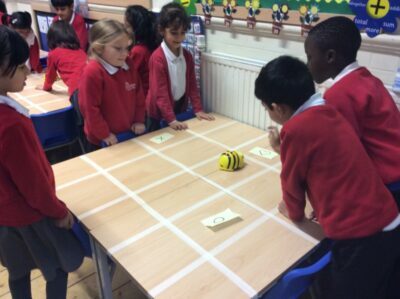 In computing we have been learning about programming using Bee-Bots. 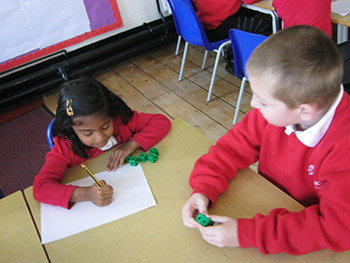 In maths we have been learning about adding to 20 using ten frames, cubes and number lines. 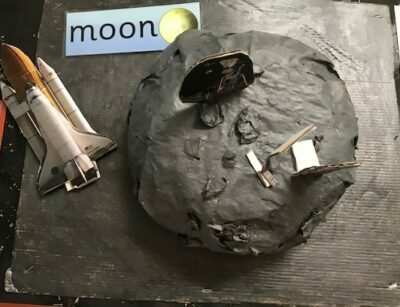 In history we are learning about Neil Armstrong: Man on the Moon. 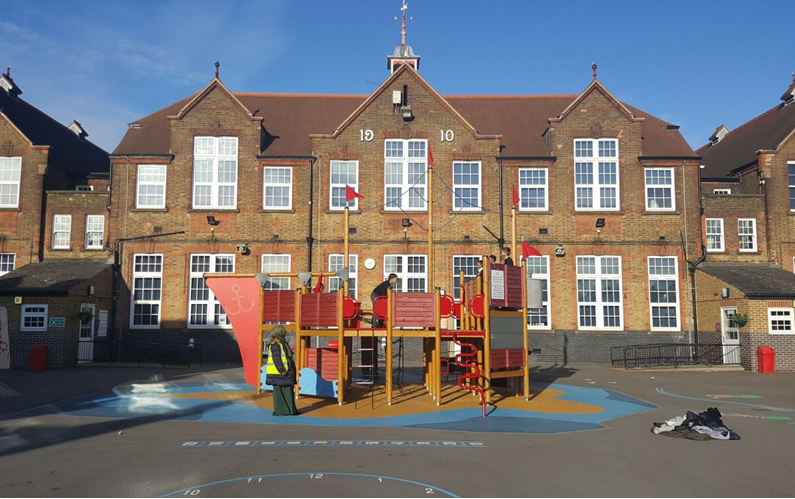 Have a look at our fantastic projects! We have also been publishing our Creative Writing work on Pobble. 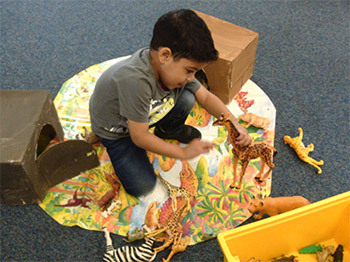 In term 1, children learnt about living things and the human body. 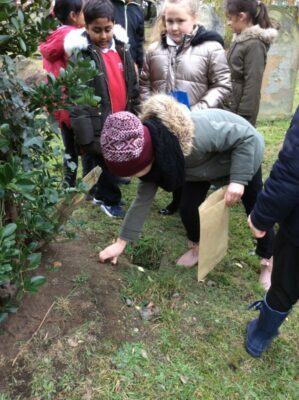 In Science, children named body parts for animals including humans and they learnt about the five senses. 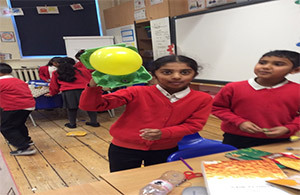 During the course of the term children understood why Diwali is important to Hindus and they made Diva lamps using clay and paint. This term we will be learning about The Gunpowder Plot and the infamous event that took place in history. 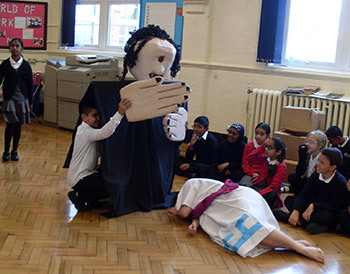 Children will learn about Guy Fawkes and the timeline of events that took place. 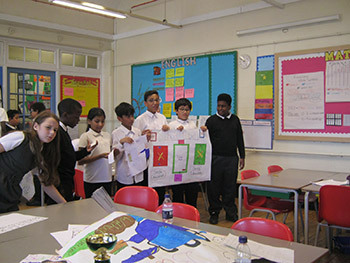 We are the first year group to launch the exciting ‘Maths No Problem’ programme, based on Shanghai methods of teaching. 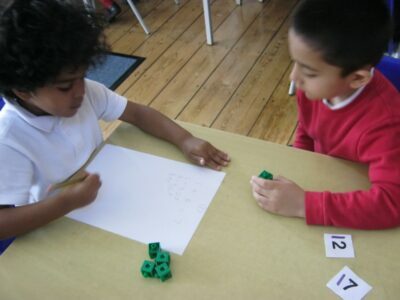 This involves practical activities that deepen the children’s understanding of mathematical concepts and promotes independence and team work. 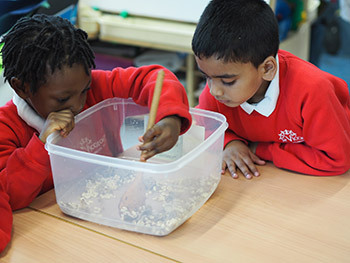 As a model RWI school we offer an excellent provision for teaching phonics. 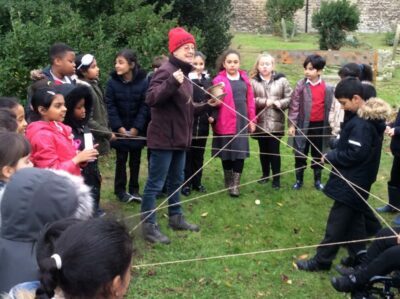 Children are split into groups and are taught by our teachers who specialise in RWI. 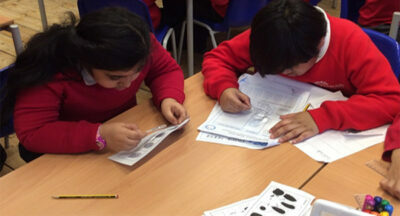 Children work towards the National Phonics Screening which takes place in the Summer Term. 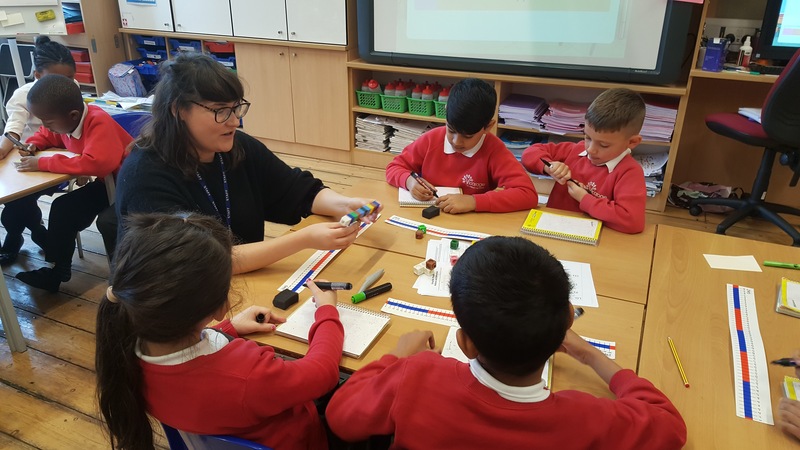 Vicarage Primary School has excelled in this test previously and even received a commendation from the Government as we were in the top 5% across the country. 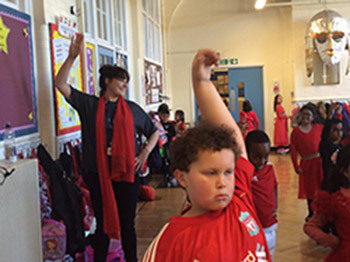 In P.E we are developing our physical skills through Dance and Games. We are learning to be aware of personal space, travelling in different ways and making still shapes. 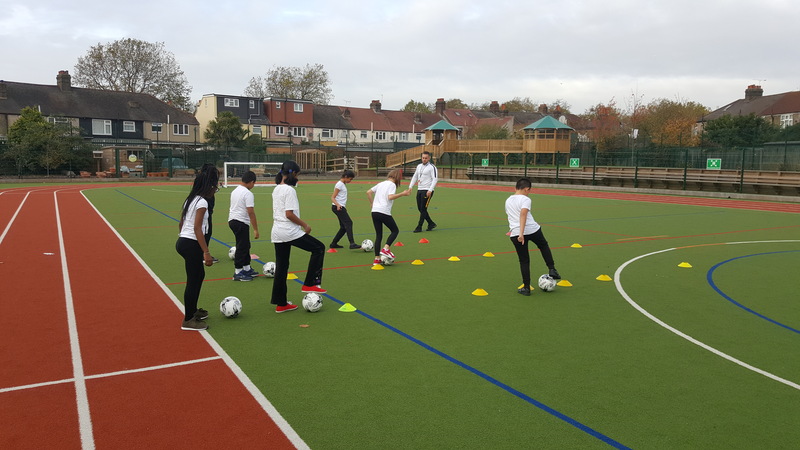 Mr Griffin the Specialist P.E coach teaches each class fortnightly. 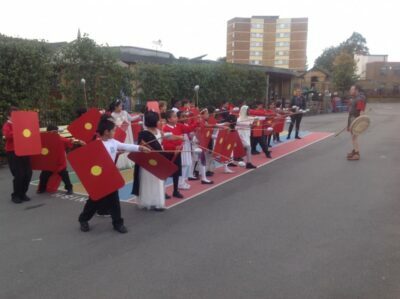 Spanish and Art are taught to all classes in year 1 on a fortnightly basis. 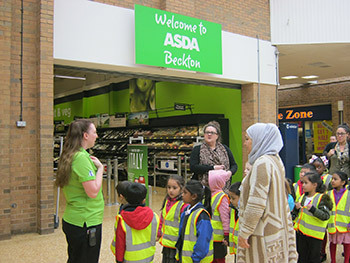 Children looked at different skills and jobs at ASDA. 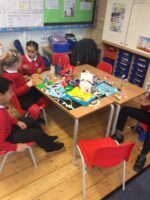 After the visit we created a shop environment in the class so that they could transfer their skills of organising, team member, cashiering, tidying up, maths skills, literacy skills, customer service (helping). 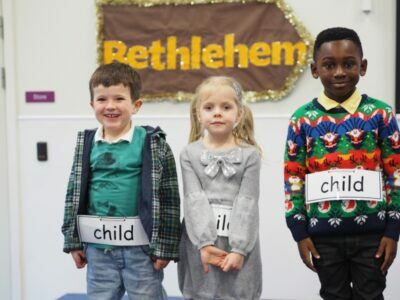 They chose and dressed up in a uniform they wanted to be when they grow up. 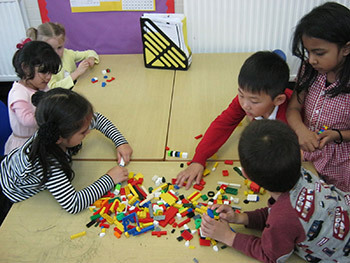 Lego pictures: was a team work activity whereby children had to work together not only to make the tallest tower but also can it stand/balance if it had a bottle placed on the tower. 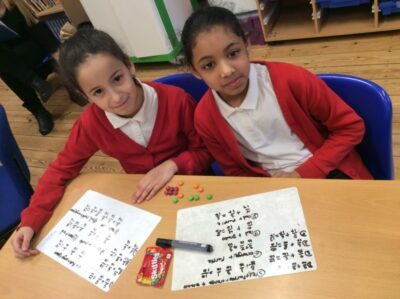 Year 1 Children working with number bonds …working on deeper understanding as to how to make a bigger number, looking at different number which make a bigger number. 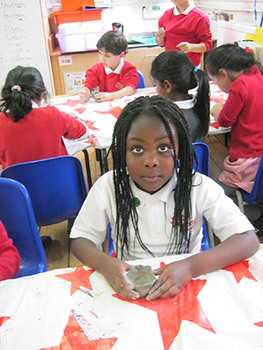 Celebrating and exploring different religions, naming and making special artefacts from Hinduism; ’clay diva’. Below you will also find links to web sites that you can visit with your child. It will give you the opportunity to talk about what your child has been learning in school in a fun and interactive way. 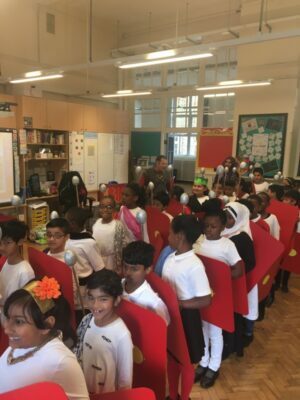 The teachers in this year group are Ms Kuzan (2K),Miss Saeed (2S), Ms Paxton (2P) and Mr Munshi (2M). .
Year 2 is a very important and exciting year to be in. 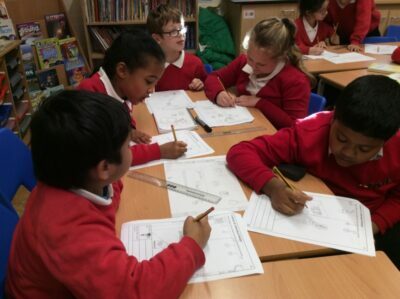 The children have to work hard to get the best results by the end of the year. 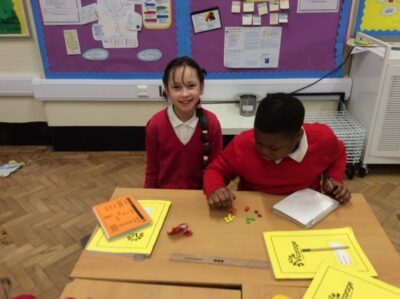 However, they also enjoy their learning in a broad and creative way. 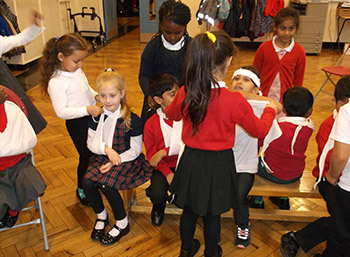 In the first term, we learnt about Florence Nightingale and the important role she played in the nursing profession. We explored the conditions of the soldiers who lived and fought during the Crimean War. 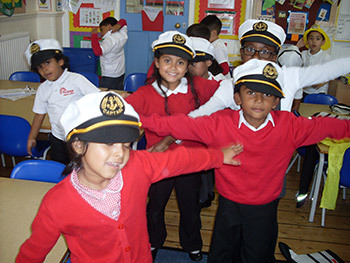 In the second term, we are boarding a pirate ship and are sailing through the seas, exploring hidden islands and the continents, whilst looking for hidden treasure, of course!Learning is further enhanced with exciting trips that enrich their experiences of the curriculum. Our curriculum map shows full details of all of our topics being covered this year. 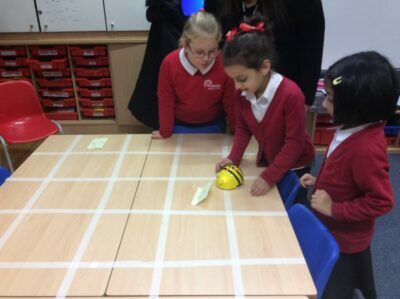 This term we have had many exciting learning opportunities in all curriculum areas. 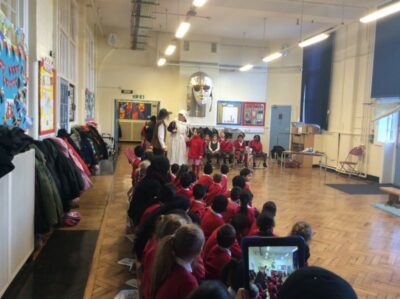 We started with a BIG BANG in our new history topic about ‘The Great Fire of London.’ We transported ourselves back to 1666 with The Rainbow Theatre production team. 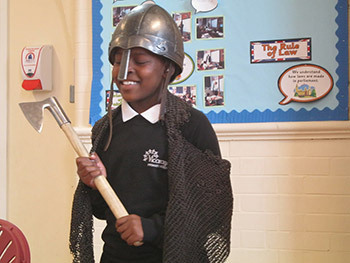 Children re-enacted key events that occurred before, during and after the great fire. 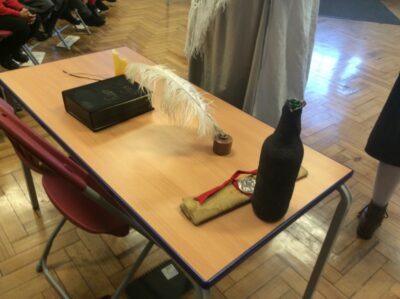 This allowed children to immerse themselves into these historical events. 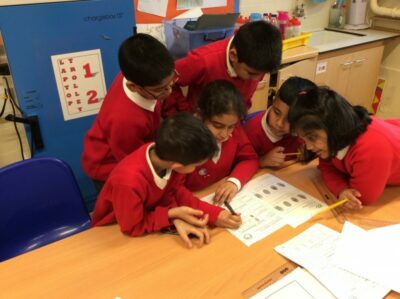 Children engaged in solving a crime that took place at Vicarage Primary School. 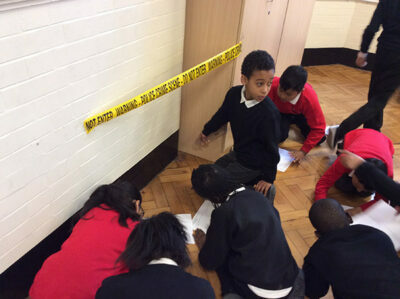 They became detectives for the day and carried out a series of investigations. One of them involved investigating a crime scene. 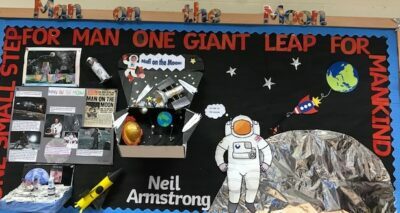 During this week, we focused on key life skills these include ‘Aiming High’, ‘Staying Positive’, ‘Working in a Team’, ‘Leading’, ‘Using Imagination’, ‘Problem Solving’, ‘Sharing Ideas’ and ‘Listening Carefully’. 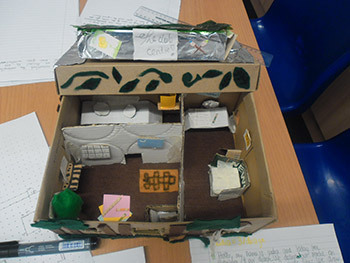 Children used these skills to plan, design and create a model for an alternative school. 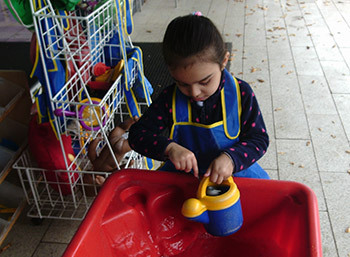 During the course of Term 3 and 4, children are going to be engaging a whole range of different learning experiences. 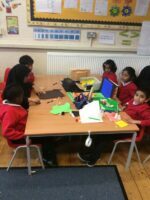 They will be visiting a place of worship to find inspiration to use for their Art project. This will be a cross curricular focus exploring themes of religious symbols through Art. 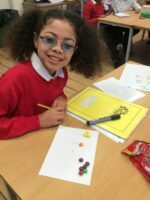 Children are going to explore advertisements during their Literacy sessions and will create an advert for a target audience. In Science, we are also going to be researching animals and the different habitats that they live in. The teachers in this year group are Ms. Adelani (3A), Ms. Alexander (3MA), Ms. Billan (3B), Ms. Mitchell (3M) and Ms. Joseph. 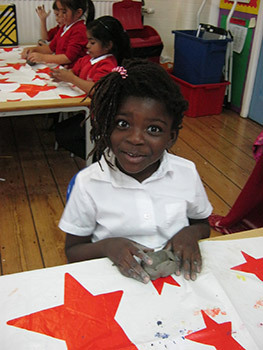 It’s been another busy yet marvelous educational term for Year 3. However, like always it was full of day to day creative opportunities. 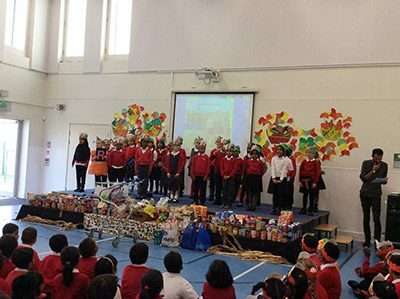 We would like to share our amazing highlights of this term with all of you. We are thrilled to announce that many of us have achieved bronze timetable badges. 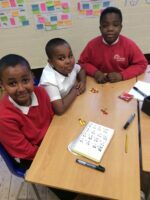 Congratulations to those who have accomplished their silver badges in times table. Thank you to our parents for their hard work at home to make it possible. 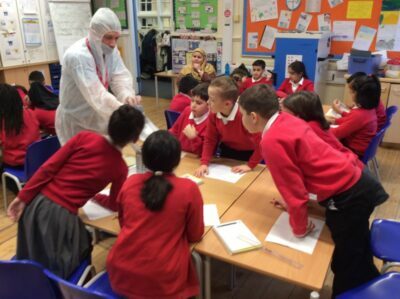 What an exciting experience for us to take part in a crime investigation. 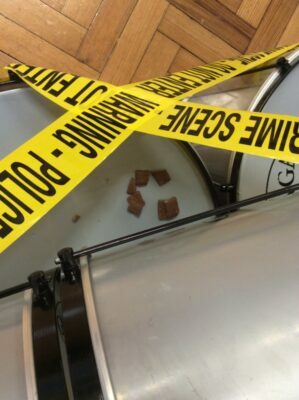 Would you believe there was a crime committed by a sugar snatcher in our school! 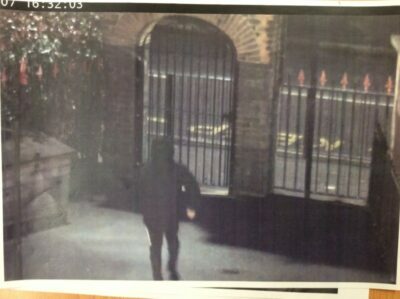 However, how could we let this person escape! We collected and examined the evidence closely, to unravel the mystery. Would you like to step into the salvage Stone Age with us! Welcome to the world of prehistoric Britain. 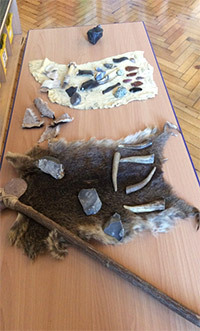 Can you imagine being a Stone Age hunter and using these tools to hunt a mammoth! It was immensely, adventurous to be Archaeologists for a day. 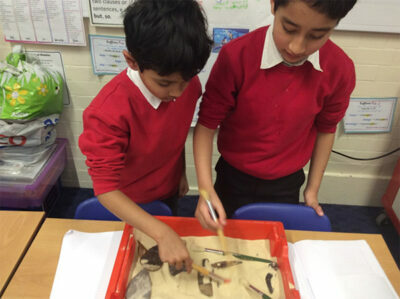 We explored and collected Stone Age tools. 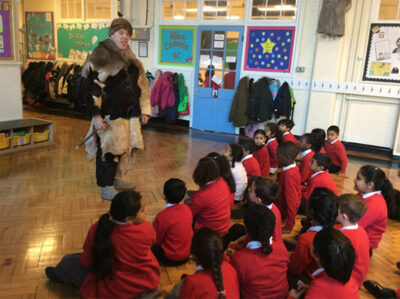 We carried on our journey into the past by being Historians to observe artefacts from the Stone Age. 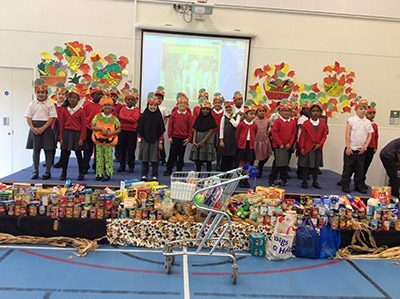 Trash to treasure was our DT/Enabling Enterprise project, which enabled us to use many life time skills. For example aiming high, staying positive, using our imagination, problem solving and working as a team. We successfully managed a mechanism that worked with pneumatic system. 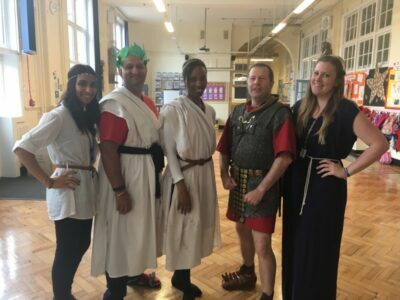 Children and teachers dressed up to match the theme – what a wonderful time we had! Ole! 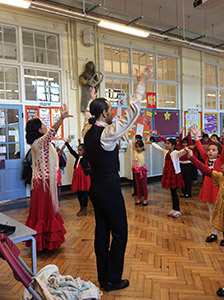 Parents/carers thank you for your generous contributions to Spain Day! 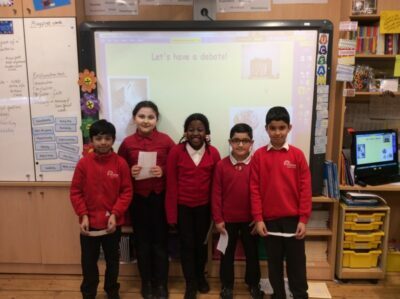 Another awesome moment for us was our World of Work Week, where we learned all about different job roles and why we work. During this time, our kind parents took time off from their busy work schedule to come and share their job experiences with us! We learned A LOT from them and were inspired to think and write about our dream jobs. Thank you parents! 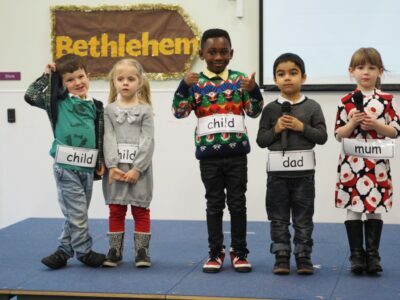 We are all looking forward to another action-packed, fun term! 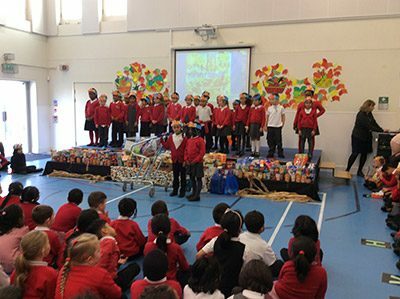 Full compliments from all Year 3 children and adults. Below are links to useful websites that may you and your child when doing homework, or with any learning in general. 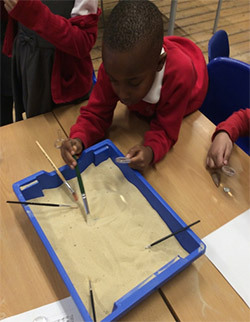 Year 4 children have had an exciting couple of terms so far, with lots of fun and stimulating subjects. 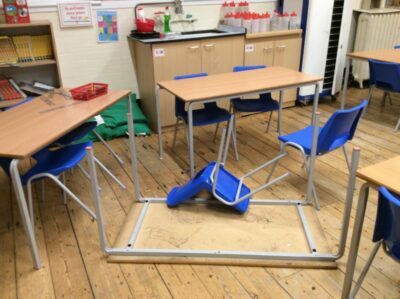 Children had the opportunity to write their own newspaper report based on a staged burglary that took place in one of the year 4 classroom. 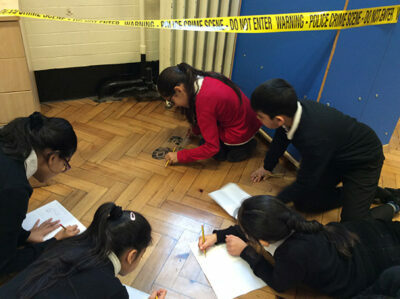 Children investigated the crime scene in order to collect evidence and to become Junior Journalistic. 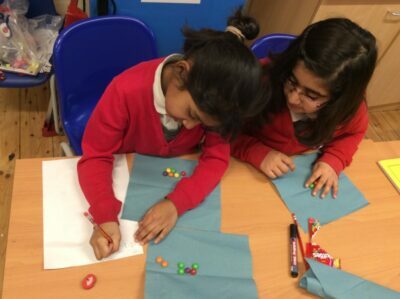 Year 4 enjoyed learning how to add and subtract fractions using sweets. 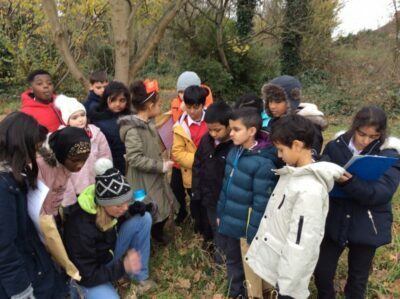 The children visited the East Ham Nature Reserve to explore various types of habitats and participated in a workshop. 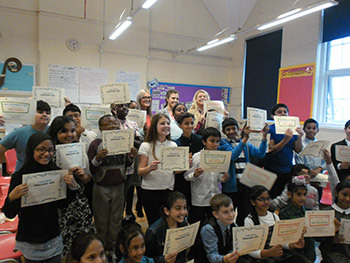 Our teachers in this year group are Miss Islam (5I), Ms Soyinka (5S), Miss Sam (5P), Ms Choppy (5C) and Mrs Maskell. Our topic next term is Forces. 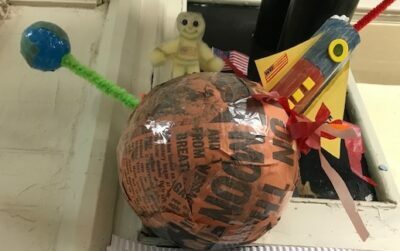 In Science, Year 5 will be investigating forces and how objects work. 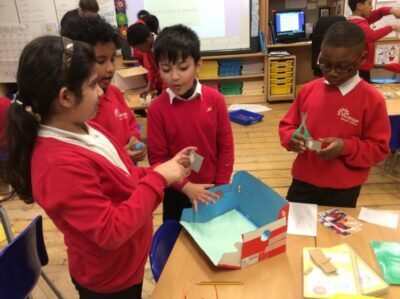 They will link this to Design and Technology, where they will be creating their own fairground and putting into practice the skills they learnt Science! For RE, we will be visiting a place of worship and examining RE through ART. Here, we will be creating our own artistic piece based on the theme of Judaism. 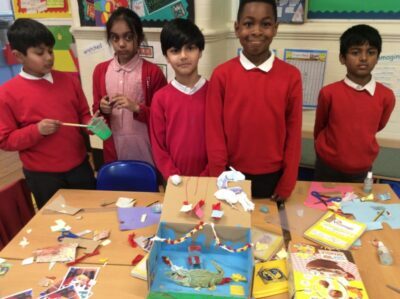 Year 5 children will be visiting Fair Play House where they will develop skills which will enable them to become more independent and resourceful. is an opportunity for four lucky year 5 children to go on a retreat to the New forest. Furthermore, they will have the opportunity to partake in fun, wholesome activities. 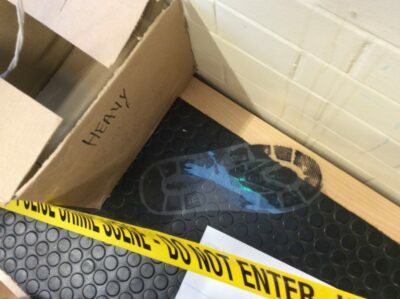 As part of Enabling Enterprise our school participated in Challenge day, where the UKS2 Hall was set up as a crime scene and children in Year 5 had to investigate the scene in order to find the Sugar Snatcher! 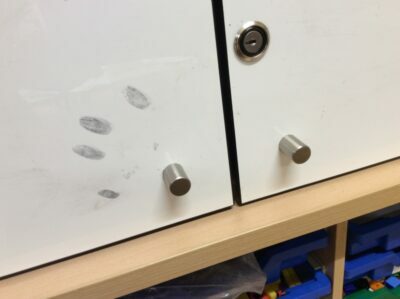 The detectives of Vicarage Primary not only had to sort through evidence in a crime scene, but also look at CCTV footages and investigate fingerprints to decide who was responsible for the shocking crime. 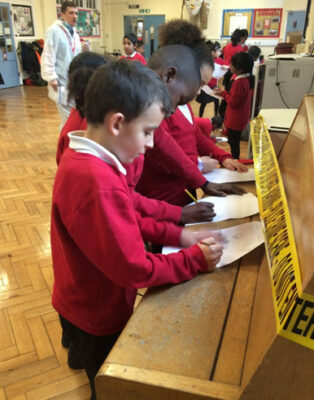 Our investigators were on the case immediately, using their skills of: Working in a Team, Listening Carefully and Problem Solving, in order to analyse all the evidence. They used all the information found to shortlist the culprit. The investigators then had to collate their evidence and present it to the case officer, explaining which suspect they thought was guilty. In literacy we have been focusing on stories by prolific children’s author Jeremy Strong. We spent some time identifying the key techniques he uses in his writing and have loved laughing at the crazy situations his characters find themselves in. We have also begun to write our own ending to one of his stories ‘This is NOT a Fairy Tale’ adopting some of his techniques. 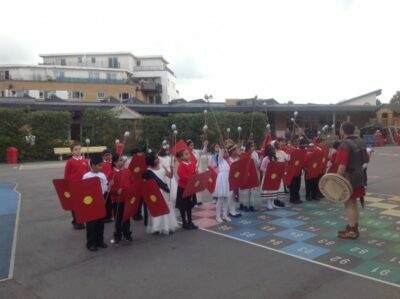 In topic we have been learning about Ancient Greece. 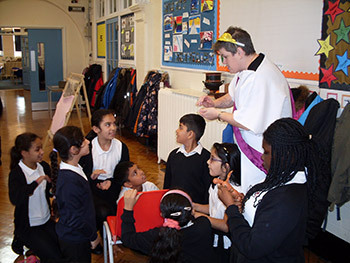 Our children learnt about how Ancient Greece has left a great legacy that impacts us today. 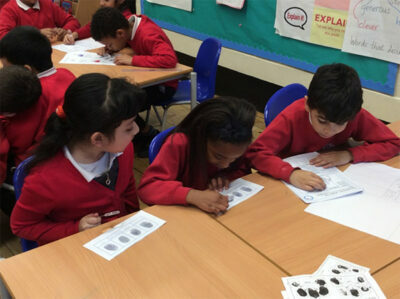 We learnt about democracy, similarities and differences in modern and ancient Olympics. 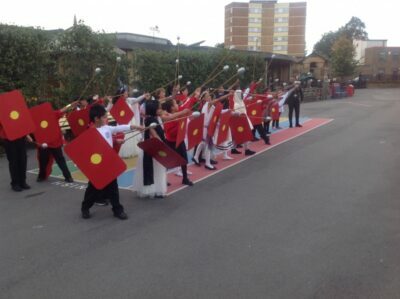 We then ended the unit with a Greek workshop. 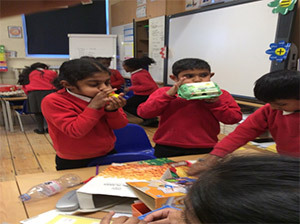 Every child was immersed in the workshop and participated enthusiastically! 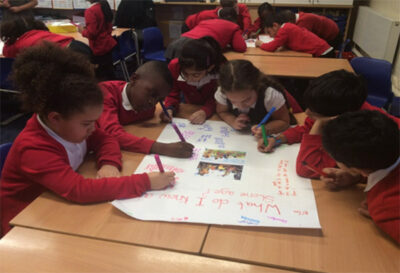 In literacy we linked our writing to the Ancient Greece topic. We learnt about the Greek Gods. We delved into Pandora’s story and wrote a recount of Pandora’s Box. 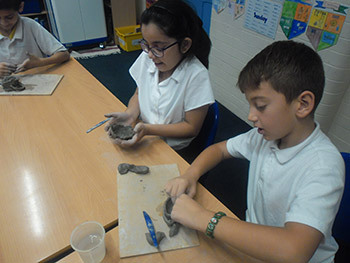 When we studied different artefacts in history, we decided to use our knowledge to make our own Greek vase out of clay! And, since we were making a Greek vase in art, we decided to write detailed instructions to help us create our masterpiece! World of Work Week is a fantastic opportunity for our children to discover the jobs and opportunity that is available in the world around us. 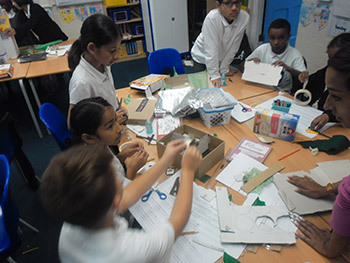 This year, year 5 children discovered the world of construction. We worked as architectures to design our buildings that were unique and eco-friendly. 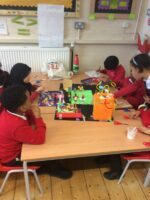 Then learnt about perimeter, area and ratio in maths, to work as engineers to create a scaled floor plan and a scaled model! 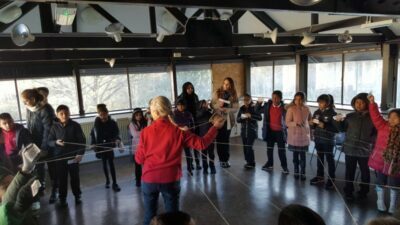 We also went to the Docklands museum to learn about structures. 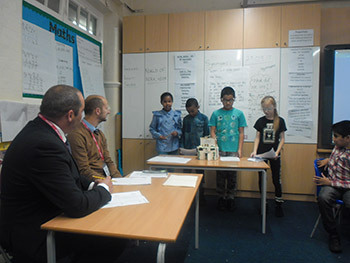 Finally, construction professionals came into school and judged our presentation. 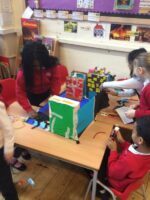 Our children did an amazing job and they had lots of fun creating their own building models! Our topic next term is Mighty Mountains. We will be visiting the Natural History Museum to learn more about it. 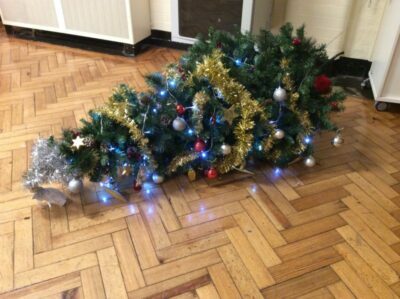 With Christmas coming soon, our children will learn about the significance of Christmas and what it means to others in RE. Poetry retreat is an opportunity for four lucky year 5 children to go on a retreat to the New forest. 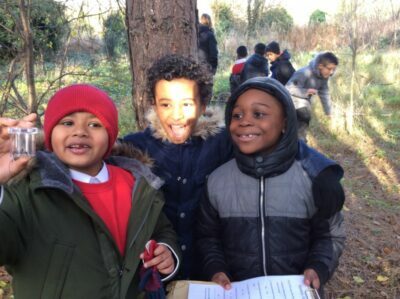 They will connect with nature and immerse themselves in writing and reciting poems. Furthermore, they will be working with a poet called, Adisa. 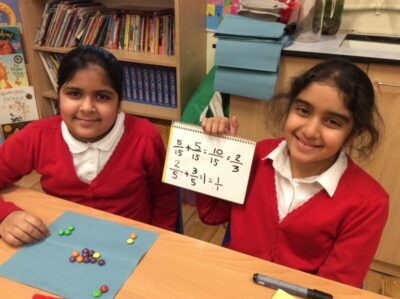 Our class teachers are Ms Zaffarullah (6Z), Ms Begum (6B), Mrs Siddiqui (6S) and Ms Iqbal (6I). 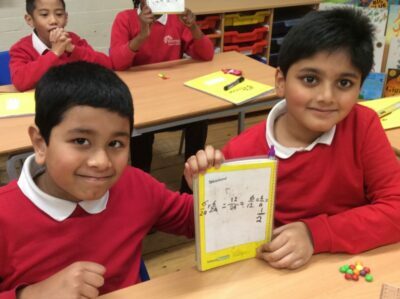 Other teachers that support the teaching of literacy and maths are: Mrs Hussain, Mrs Ahmed and Mr Rahman. 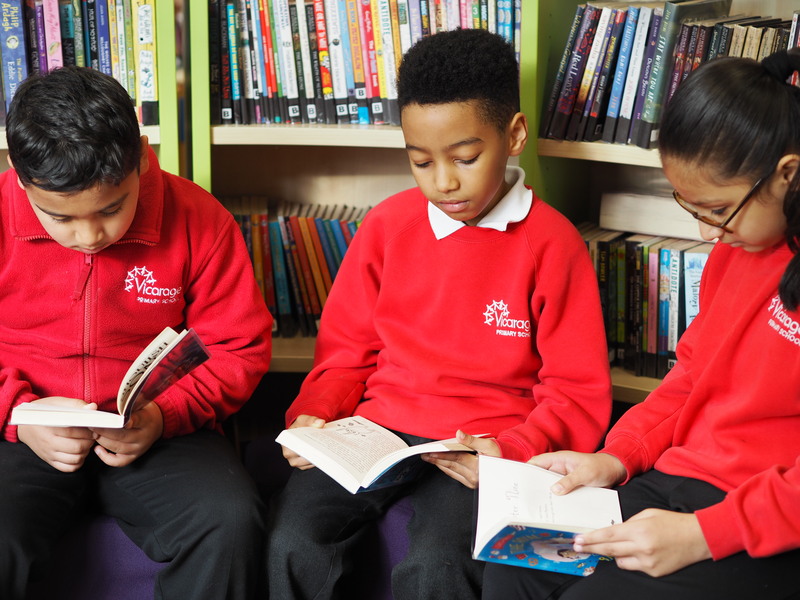 Year 6 is always an important year for our children, since we are heading towards our SAT’s and this means lots of hard work, encouragement, motivation and independent learning. The main focus for most part of the year is Maths and Literacy, as these are the areas our children are tested on. 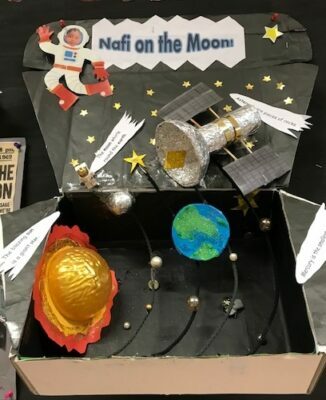 However, the year 6 curriculum aims to provide our children with a wide range of interesting topics (in other subject areas) that will help them develop and learn in a fun and engaging way. Please refer to our curriculum map to see all of the topics we will be covering this year. 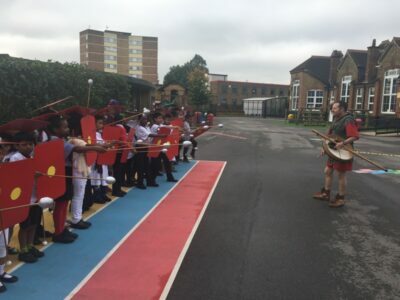 Currently in year 6, the children have had the opportunity to take part in the ‘Every Child A Musician’ (ECAM) lessons; these take place after school. All of the children have been assigned different musical instruments such as: the violin, guitar and keyboard. 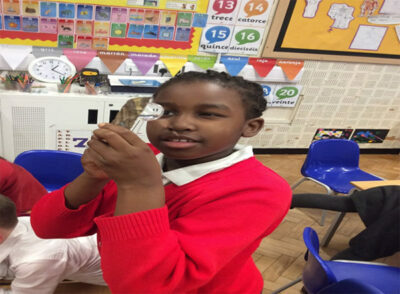 During their ECAM sessions the children are taught by a professional musician for 30 minutes every week, they are also set homework so they can perfect their skills learnt in their sessions – this all leads to a big musical concert at the end of the school year! Finally – educational Visits! 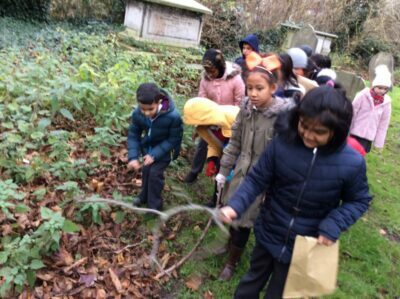 In year 6 we take our children on stimulating, interactive trips to places that offer experiences which they may not have had: theatre, museums and theme parks are just a few examples of what we offer! Most trips have been scheduled to take place after SATs, where they can relax and learn, not having to think about tests. We are looking forward to making this year ‘a successful year’ to remember, for our year 6’s. Document below outlines secondary school transfer for Year 6. 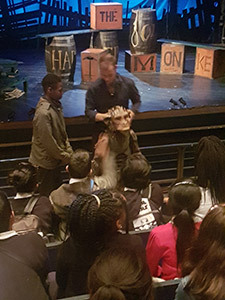 Hartlepool Monkey – Children visited the theatre show and got to experience theatre production, back stage. 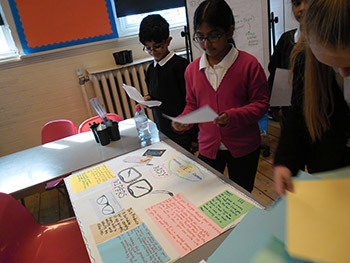 World of Week – Children in Year 6 brainstormed in groups and invented a product, which was presented to the Dragons’ at the end of the week. 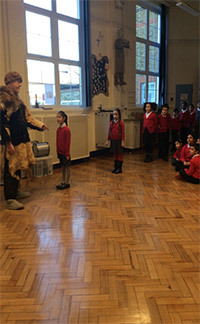 Viking Workshop – All children took part in a Viking workshop that helped develop their own understanding of Vikings and why they migrated to England.